It is missing no longer! Even better, it did not take any water damage- a couple of jerseys did and will try to salvage them later, but 8 jerseys were in this bag and have been photographed. The key one, though, is my very first jersey, something I've been trying to find for quite some time! Keep in mind, these were just in a bag in storage, exposed to every temperature change and several leaks, so they are all wrinkly and not too nice looking. I don't care. I am thrilled to have them back! For many years I thought that it was April 1996 where I discovered the game, but then I determined it was actually February 1996. 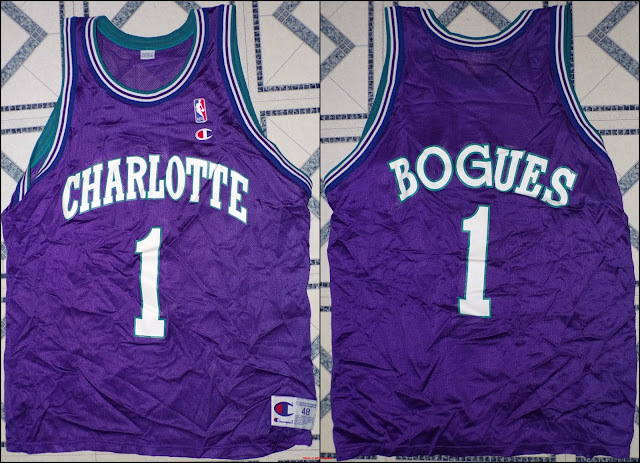 A small difference, but important, because it means I got to see more of the 1995-96 season than originally thought. 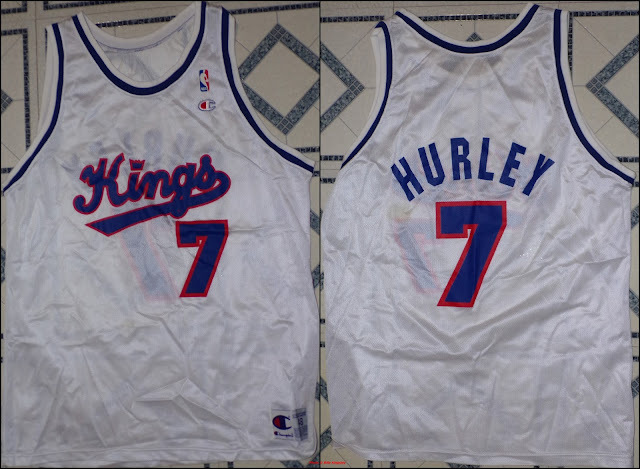 What I now think, on retrospection, was that the date of April 1996 that stuck out in my mind so much was the date I got this, my very first jersey. I can still remember where I got it, too. A sporting goods store on the upper level, about halfway through the mall, in the Poughkeepsie Galleria. It's long gone. The memory remains. In Hyde Park, just a short drive away, there was a Champion outlet. 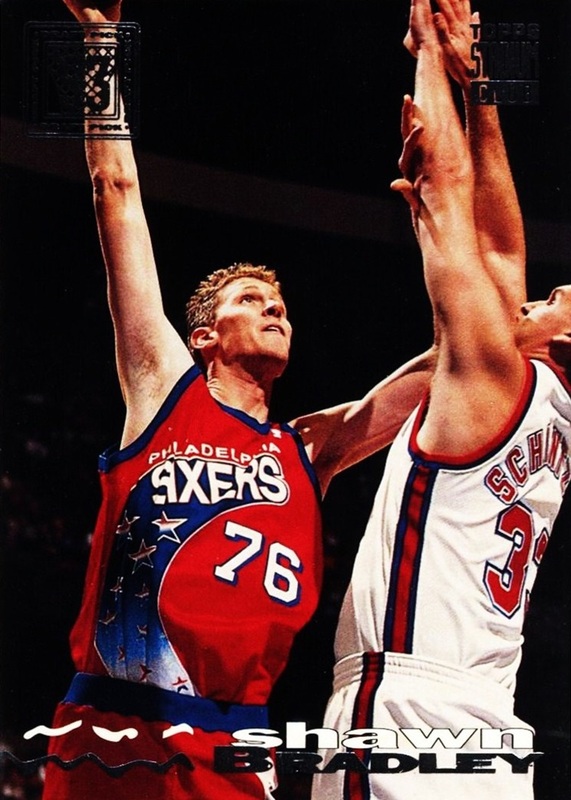 As the maker of the jerseys, both worn on court and sold to fans, they always had a jersey supply. There was usually something wrong with them...I could never usually figure out what...but I didn't care. Just like with cards, I collected everything I possibly could, and when we would visit it- a couple of times a year- we would usually get whatever jersey they had that I could fit into. It didn't matter the player or the team. If I could fit into it, it went into the cart...or at least that's my memory of it. It may not be totally accurate. Occasionally I would get jerseys elsewhere as well, but most of my collection came from that long closed Champion outlet. Sometimes they would get older jerseys there too. I discovered the NBA in 1996, as I mention, yet I was able to get jerseys there as old as 1993-94...like so. The Hurley did take some slight water damage, but not too horrible. Not bad enough that if I could get into it, it would prevent me from wearing it. That's a big if, but hopefully some day. Not that I have anywhere to go anyway...school is long done, haven't had a local card show to go to since 2005. As you can see, pretty much the only thing that's accurate is that it was red and had the NBA logo. Even the font on the jersey number is wrong. I didn't actually remember having these two. 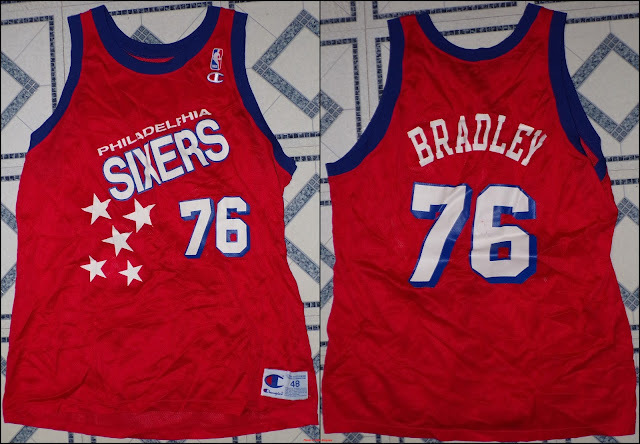 Some of the jerseys I had I remembered having and wearing, but these...I had no memory of whatsoever. when they came out of the bag was akin to the first time that I had ever seen them. I thought the Kings were one of the teams that was not represented in my collection...I was wrong. 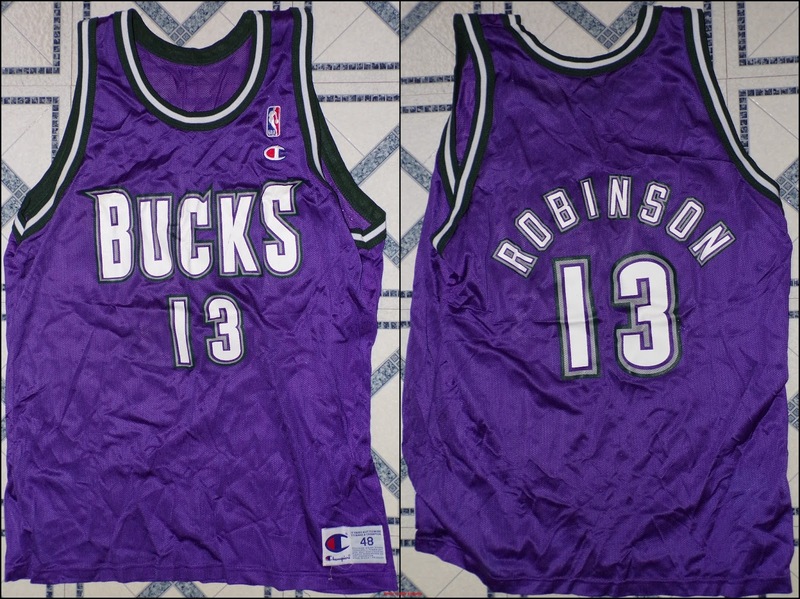 I've pegged this jersey as from the 1994-95 season. It's another I had no memory of having. I remembered having a John Stockton jersey which is still missing...which makes me wonder if I was remembering this one and pretending the 4 was a 1. It's possible. 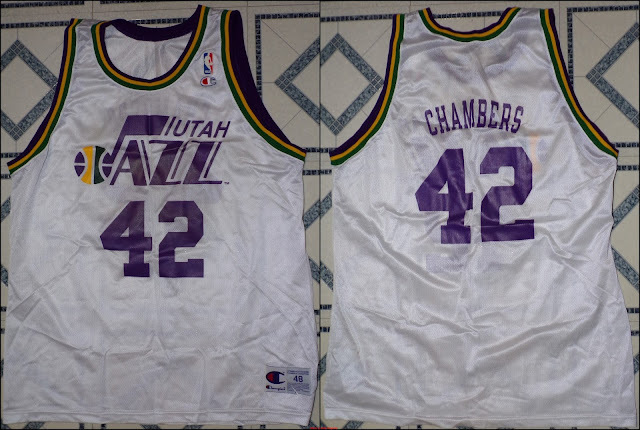 Tom Chambers actually stuck around in the NBA until the 1997-98 season. I don't remember seeing him play although I'm sure I did. Memory is just bad, I guess. 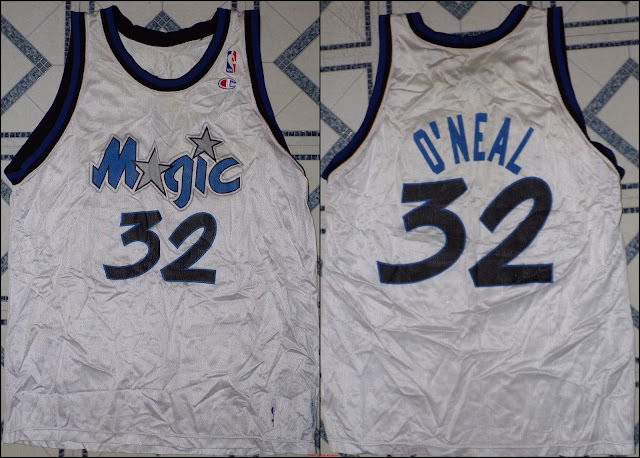 I didn't remember having this Shaq jersey until it came out of the bag, but then I remembered it. Its' from 1995-96, although the jersey would have been the same from 1992-93 through 1995-96. 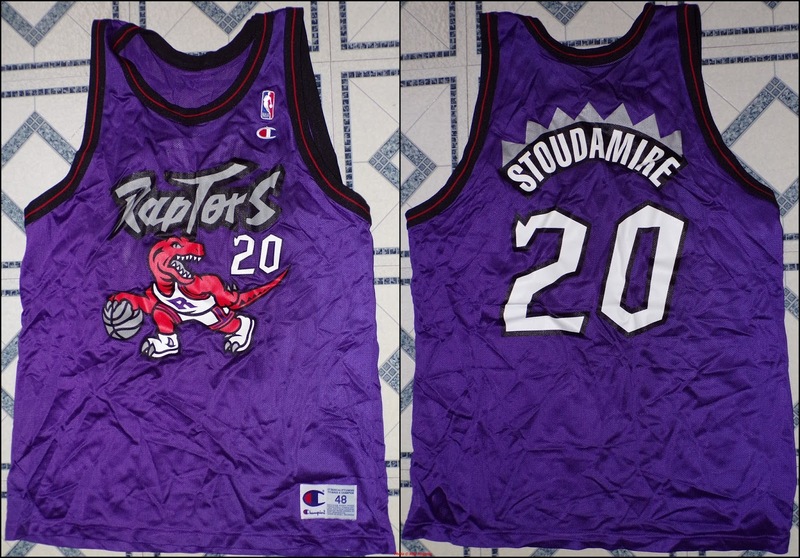 I have this Damon Stoudamire jersey tagged as 1996-97, but it could very well be 1995-96 as well. 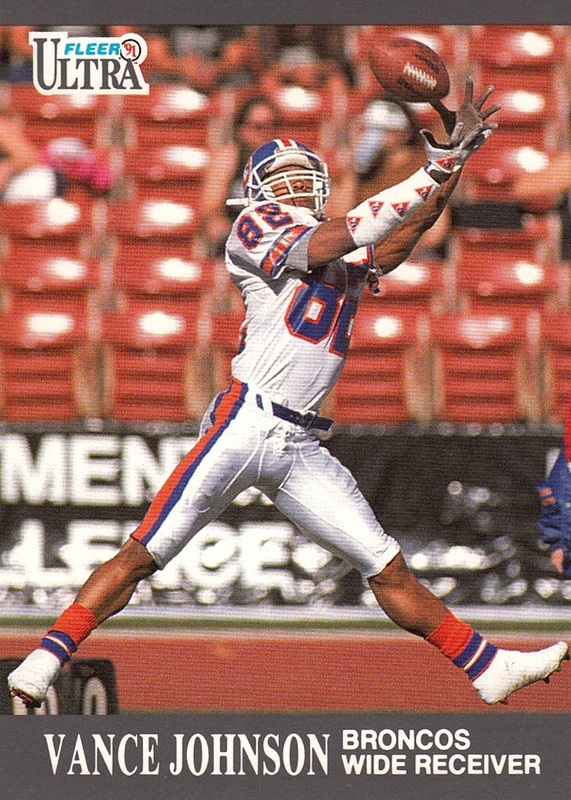 Stoudamire won Rookie of the Year in 1995-96. I've always loved this jersey design, but this is a rather poor representation of it. Like the Magic jersey and the Hornets jersey later in the post, it's missing the pinstripes that "made" the jersey. You get what you pay for I suppose. I had no memory of this one either. Keep in mind it's been about 15 years since I've seen these. This next one I actually remember. It's also one of the very few that I have a period photo of me wearing. 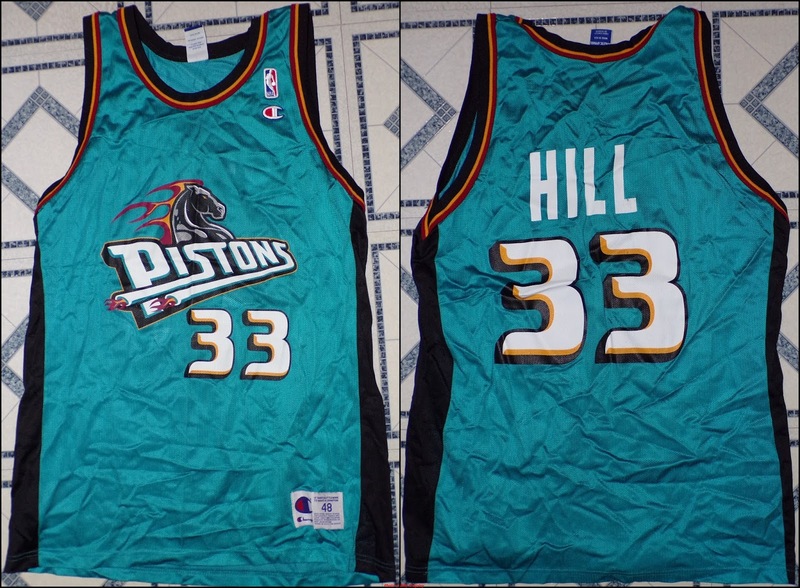 I am one of the very few people who liked the Teal era Pistons jerseys and I still do. This one is for sure the 1996-97 season. I'm not going to post the picture because it was taken at a family outing but I certainly remember it. This last jersey defies my memory. I remember trying to find this jersey, or any one of the three colors that the Hornets wore, of Muggsy Bogues. I remembered not being able to find one in my size. Turns out, I was wrong! The purple was the rare alternate, as well! This was the first one to come out of the bag and it was a total shock to me. I just wish that they hadn't cheaped out and put the pinstripes on it. I also wish I wasn't too fat to fit into any of these, but, maybe some day. It's one of my "life goals" to be able to fit into my original jerseys but time will tell. We did find a couple of other jerseys but they need some work before they can come home. I am loathe to put any of the jerseys with the painted on graphics into a washing machine- the paint can crack and was brittle in some places when new- but they took some water damage and smell quite poorly so I think I am going to risk it. Wilt Chamberlain - Philadelphia 76ers, from 1996-97 50th Anniversary season. I had no memories of this one. I remembered the Elgin Baylor Lakers jersey, which never got lost in storage, but not the Wilt. there were one or two more that I can't remember which ones they are now. Possibly my Dennis Rodman Bulls jersey. Even though I can't fit into these jerseys anymore, and have not been able to for a long time, I'm still really thrilled to have found these. I may not be able to wear them, but I'm still a basketball fan and collector, and I'm not letting them out of my sight any time soon, ever again. Right now I have them folded up in a box right next to my computer. I need to come up with a better storage space for them but for now I am just happy to be able to look at them whenever I want to. Total Blaster 9- the best one yet! Yesterday was going quite well, until right before bed...I was having a small peanut butter snack before bed, and there was some foreign object in it, and it broke one of my teeth. First time I've ever had anything like that happen...not really looking forward to the dentist visit that will surely come from this. (I really just need him to file down the sharp part, I could do that myself probably, but...I won't). We'll be giving the what-for to Atkins as well for having some foreign object in the peanut butter bar. 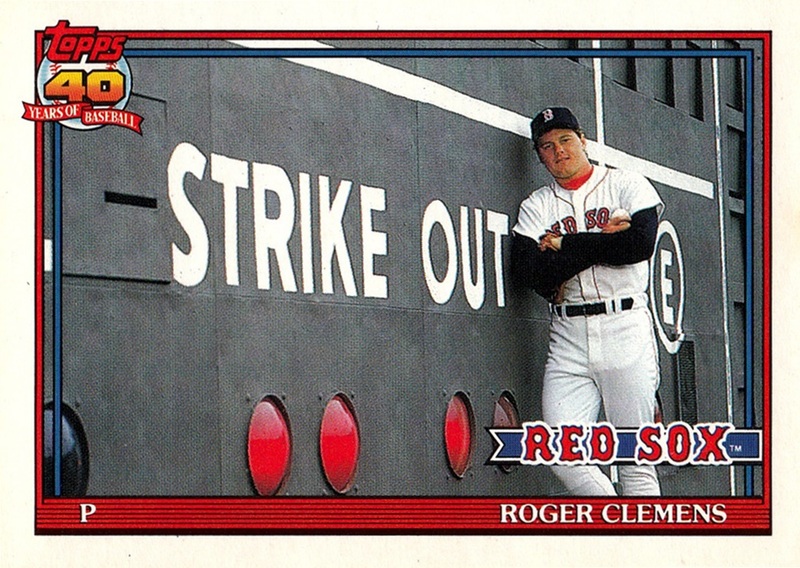 Today's Total Memorabilia blaster is almost the halfway mark...and it turned out to be the best one yet. All 5 cards were new! Daniel Suarez is an up-and-coming driver who won this year's Busch championship...becoming the first driver from outside the US to win a major NASCAR championship. Suarez hails from Monterrey, Mexico. David Ragan is the red parallel. 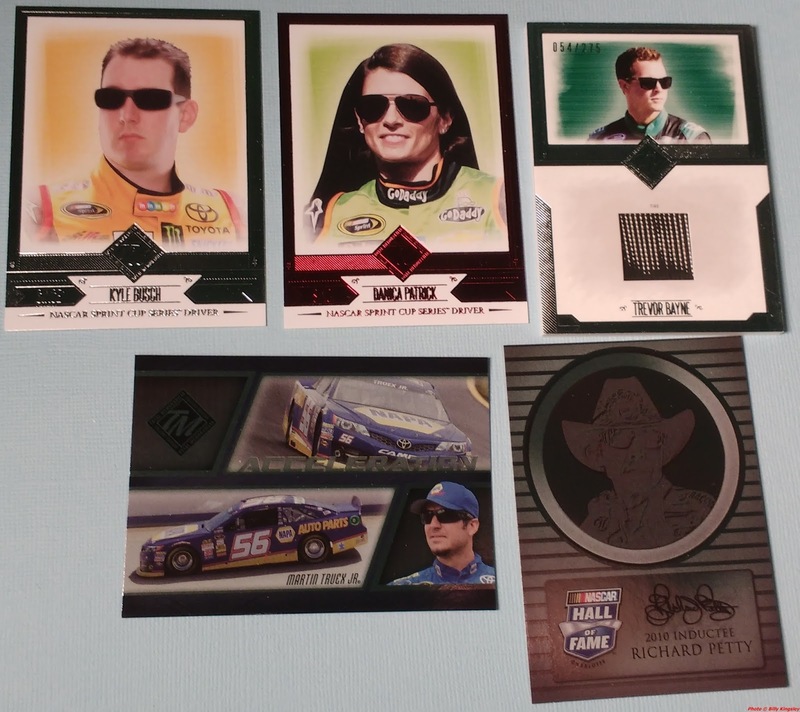 I have a knack for pulling Ragan cards from blasters. 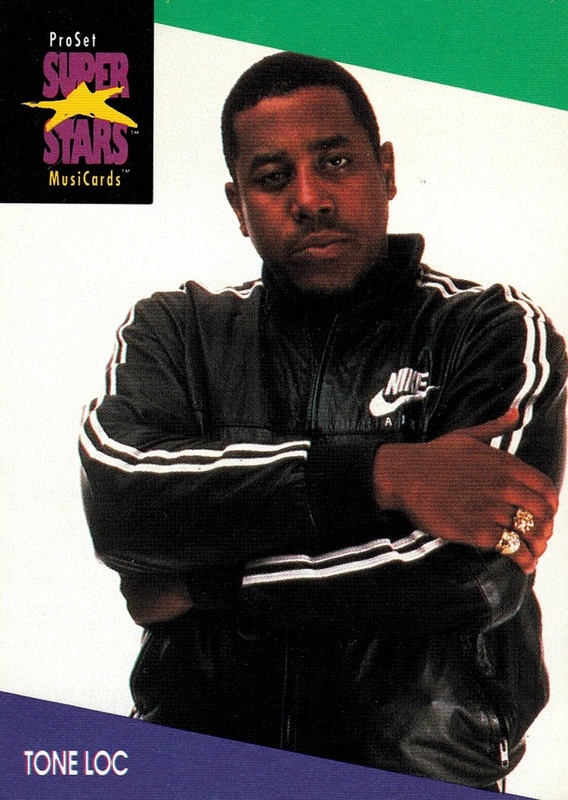 For several years every single one I bought included a card of him. Kyle Busch Acceleration is new, one of the 4 I needed on the set. Dale Inman Hall of Fame Placque is a good one, the all-time winningest crew chief in NASCAR history- 193 race wins and 8 Championships. To put it in perspective, in NASCAR's 68 year history, only one other crew chief has cleared even the 100 win mark. Tire relic is Jeff Gordon! Jeff has always been a favorite of mine, and this is the first solo relic of his I've ever pulled! 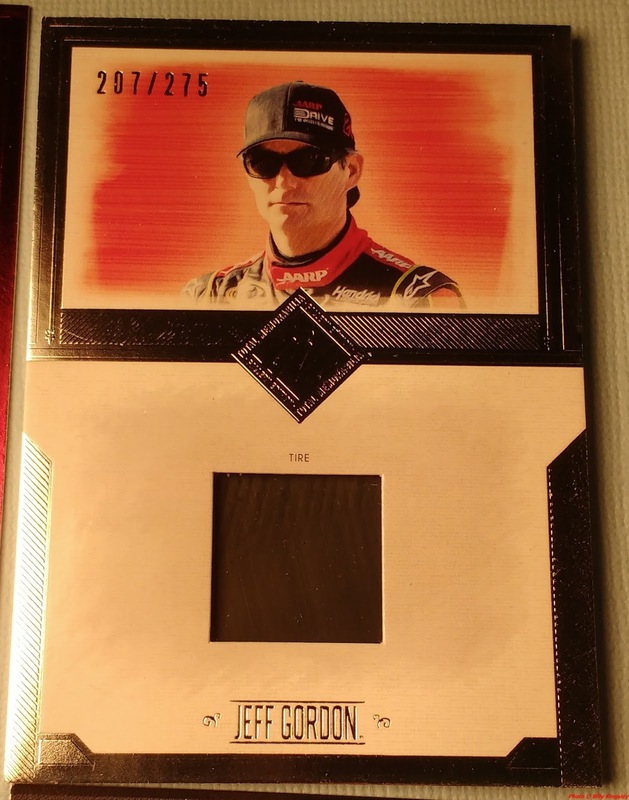 It's not the best card of his I've pulled- I pulled a printing plate from 2006 Legends- but this is by far the best relic I've pulled from this Blaster project...and there's still 11 more to go! I did pull a dual car cover with him and Jimmie Johnson several years back as well. 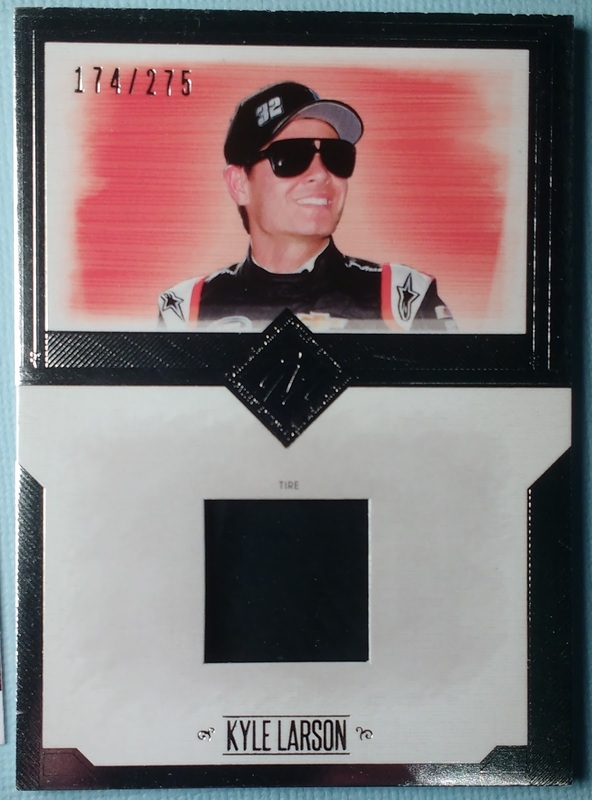 Jeff is the winningest driver in my lifetime, with 94 wins, which also ranks him third all time. The first lap of NASCAR I ever saw was the first he led in his career. I actually have one the multi-relics of Jeff from this set that I purchased as a single a year or two ago. 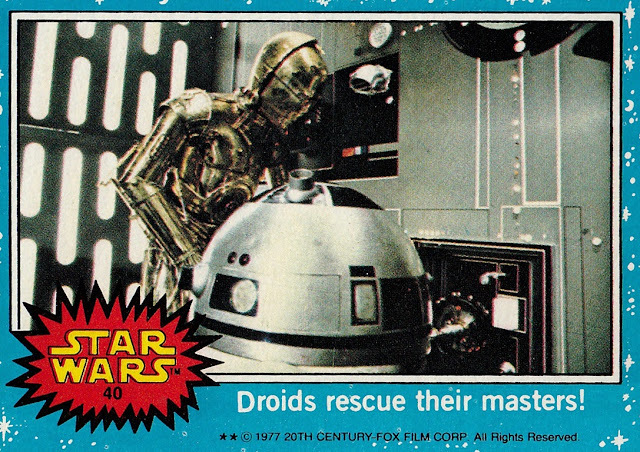 As you can sort of see, the dual relics are gold foil. The triple relics are blue foil, I don't know what color foil the quad relics have. A day late in getting this posted, yesterday was a busy day. While I was able to get the blaster opened, I could not make time to get the photo taken or posted. Yesterday, besides opening the box, saw me go to Hobby Lobby to get a model for my club's Christmas exchange, (and get some new outdoor lights as most of ours stopped working I don't like Hobby Lobby, but I do like 40% off coupons), Target to get some cards for my Secret Santa exchange and in exchange for Jaybakerfan's Christmas Tradeathon, visit my local dealer to see if he had gotten something in (no) but found some other stuff to get- for both myself and others. Then, packaging up three things to mail out, thanks to my brother for actually putting them in the mail for me. A little later, we went to our town's Christmas Light Parade, which I live streamed to Facebook, first time I've done that...I didn't have the technology to do that at any previous parade- then walked down to see the town's tree lighting. After that, we all went out to eat at our favorite restaurant, which was excellent as always, and by time we got home I was exhausted. It's more walking than I usually do and even though it was probably beyond my capabilities I did it anyway...too sore to even go and spend the $115 gift certificate I got for Barnes & Noble today. But I think it was worth it...some times you just have to do something and deal with the pain it causes later. 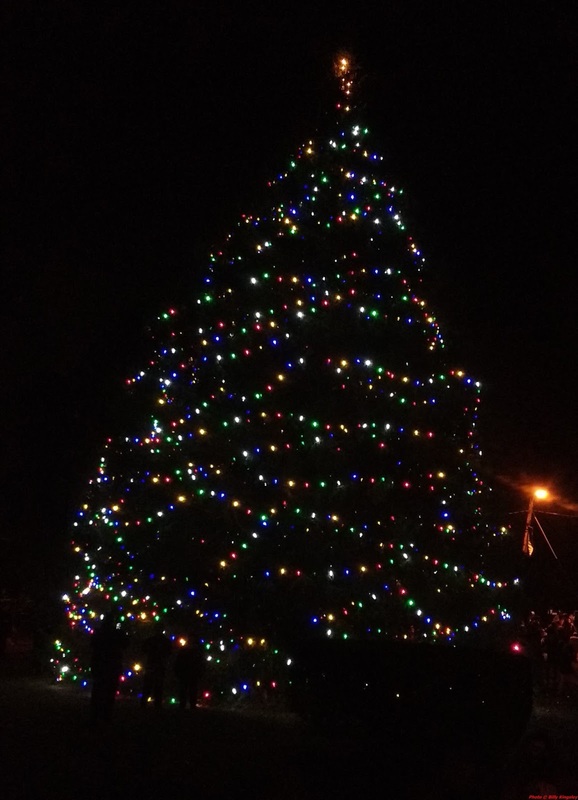 One of my absolute favorite things about Christmas and the Christmas season is seeing the lights. There is nothing quite like it and if it were up to me they would be lit all year. This blaster was a success, even if my photography is sketchy at best, and seems to be regressing. 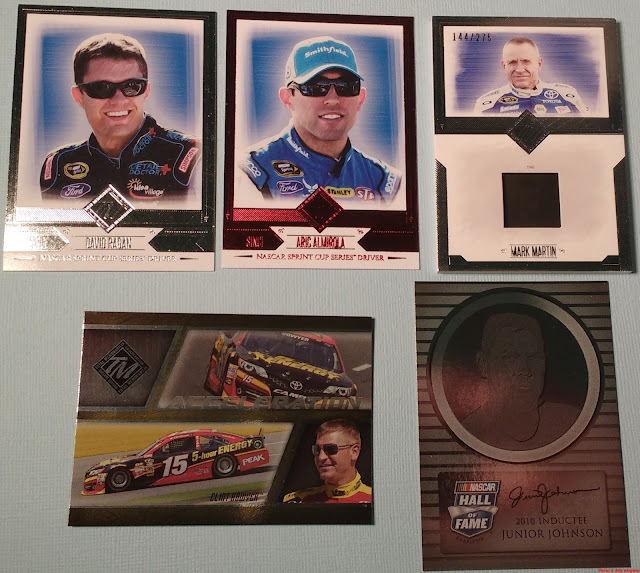 David Ragan is new, Almirola, who I thought was a duplicate is actually new, the Bowyer is a duplicate, and the Junior Johnson is new. The relic is new, and it looks much better in hand than this craptacular picture. Sorry about that! 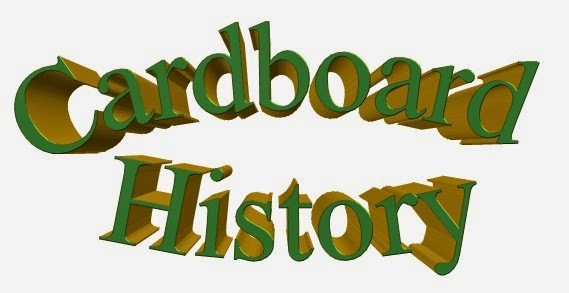 I can't believe I forgot it, but yesterday, November 22nd, was the 2nd anniversary of my launching Cardboard History. It's been a great ride so far and I have no intention of stopping anytime soon. I almost missed it totally but when I was getting ready for bed, I decided to check Facebook- something I rarely do anymore, since it devolved into nothing but political whining- and in my memories was the post I made announcing the launch. 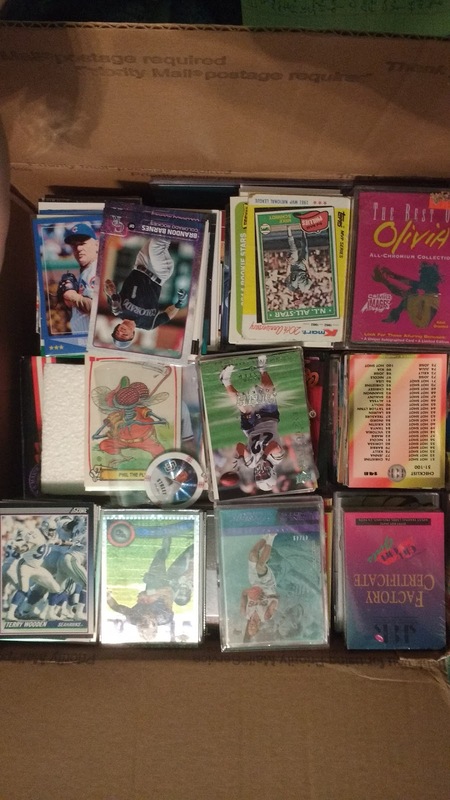 I decided to get back up out of bed and open up a pack from my stash of unopened packs...some of which have been sitting in there since before I launched the blog, in fact. 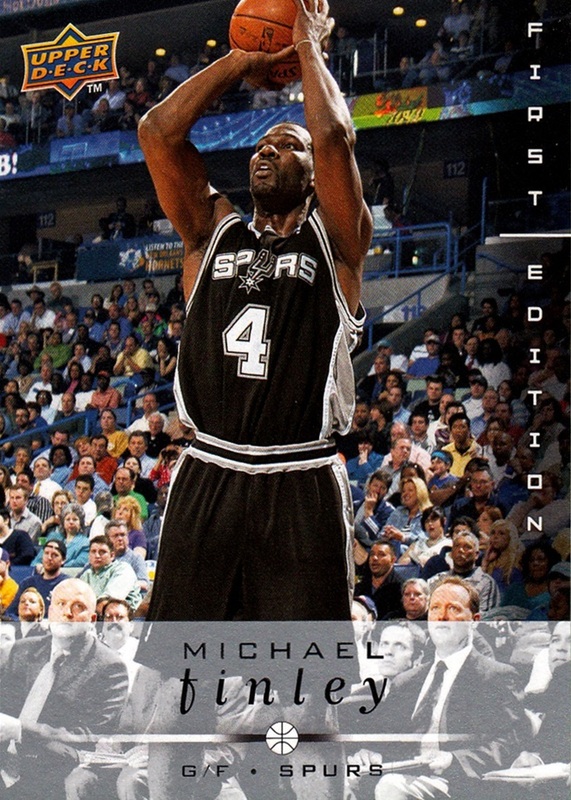 I selected a pack of 2008-09 Upper Deck First Edition, a pack I got out of a repack sometime in 2014. 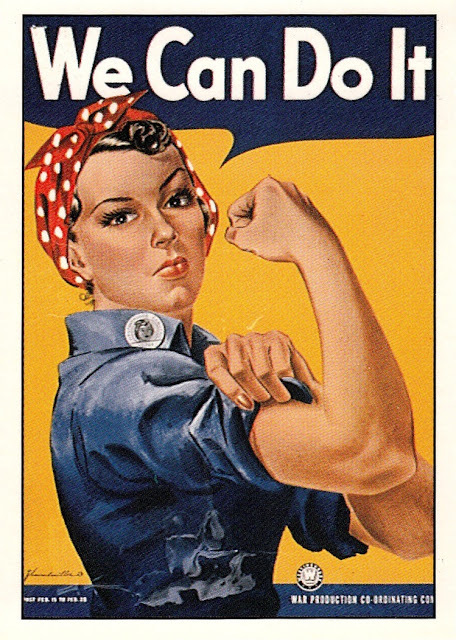 Thank you to all my readers- and especially to my commenters- for making the blog somewhat of a success. For a blog that really doesn't do a lot of baseball, I get more views than I would have expected, averaging about 100 per post. My most popular post, since it got linked to Uni-Watch, is over 700 now. As somebody who's OCD about numbers that makes me pretty happy, I have to be honest. Today was also time for the 7th blaster of 2014 Total Memorabilia, and it was not a good one. 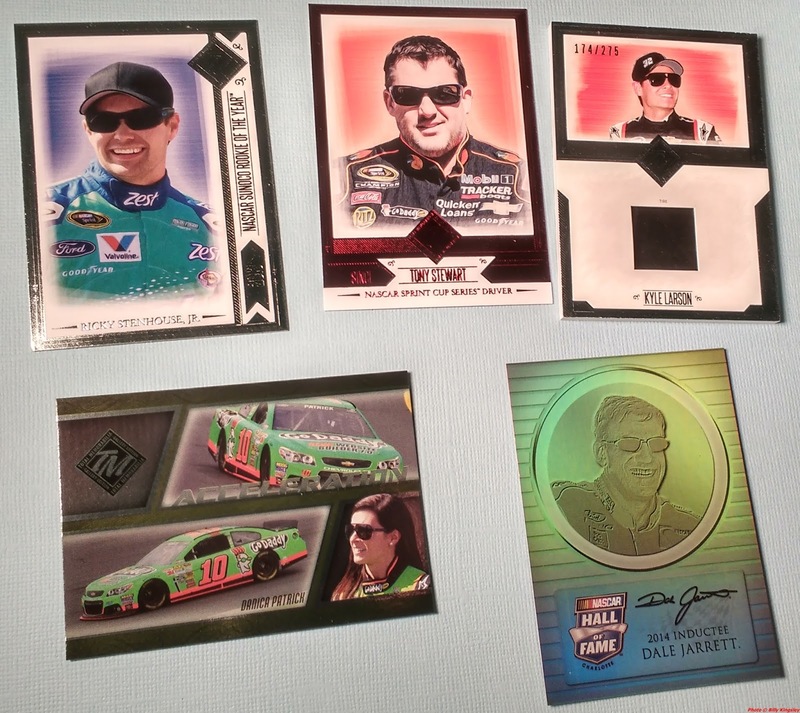 Kyle Busch base and Danica parallel are both new...the rest are all duplicates, including the relic. Knowing Press Pass it doesn't surprise me that I got two copies of the same relic in two out of the last three boxes, but it's still a disappointment. And since it's serially numbered, my OCD doesn't allow me to trade it for anything else, like say a relic I don't have. The Truex and Petty (my third copy of the Truex, I believe) are available for trade, as they are both duplicates...and with 13 blasters to go, with the way it's going, I'll see them again. 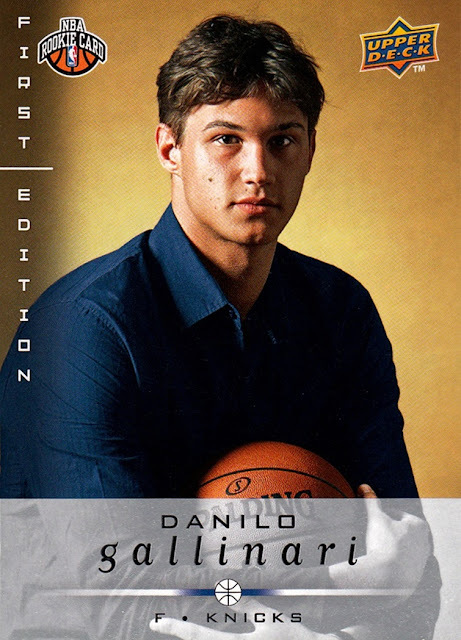 The 2008-09 First Edition pack, which I actually opened yesterday but am posting below the Total Memorabilia box, was much better, as all 10 cards were new to my collection. 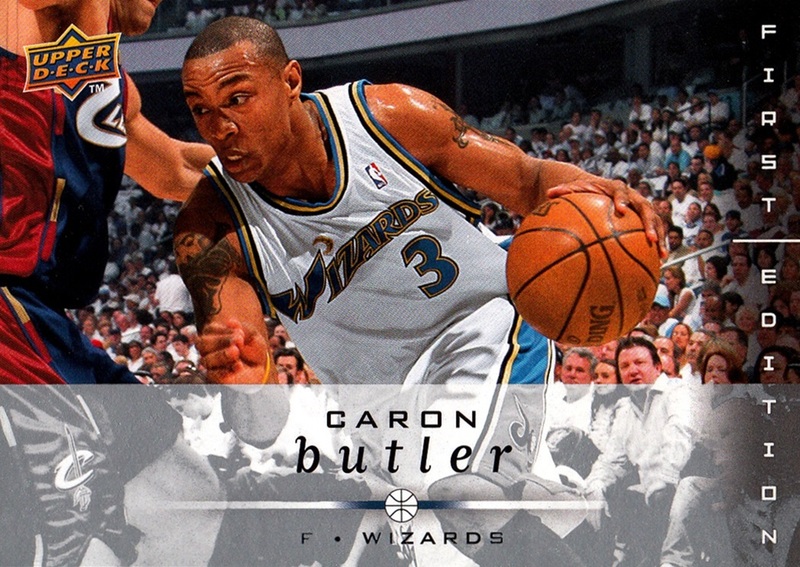 Four of the 10 came out of the pack damaged, with the first card, Caron Butler, being pretty badly bent, but as I've always said, I'd rather have a damaged card than none at all. Considering I mostly have to get retail these days, I'm getting pretty used to getting damaged cards. Since it's something I did special for the anniversary, here are all 10 cards, in numerical order, just for the heck of it. Davis is no longer in the NBA. I remember, when I was first getting back into the NBA, the Warriors traded Ellis to Milwaukee and the fans booed like crazy- Ellis was a fan favorite in Oakland- the reaction was so bad it played a role in Chris Mullin leaving the team- but it was done with the future in mind, to make room for Stephen Curry, 2x reigning MVP and a threat to go three-in-a-row. Ellis is now with the Pacers. 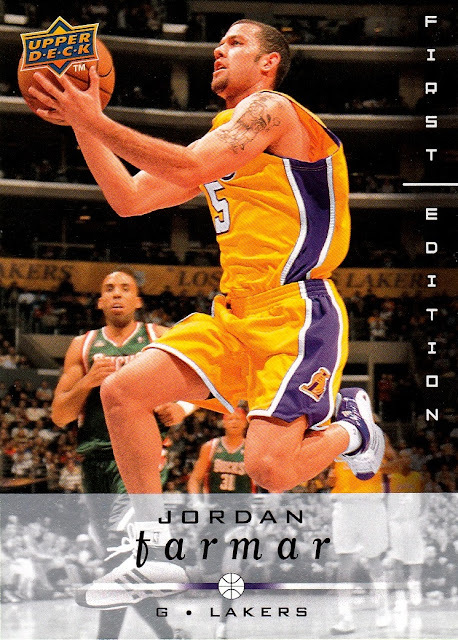 When Farmar came into the League, he was one of only two Jewish players then in the NBA. I don't remember the other though. Amare Stoudemire converted during his career and now lives in Israel. Farmar is still on the fringes of the NBA, playing with the Kings briefly this season. 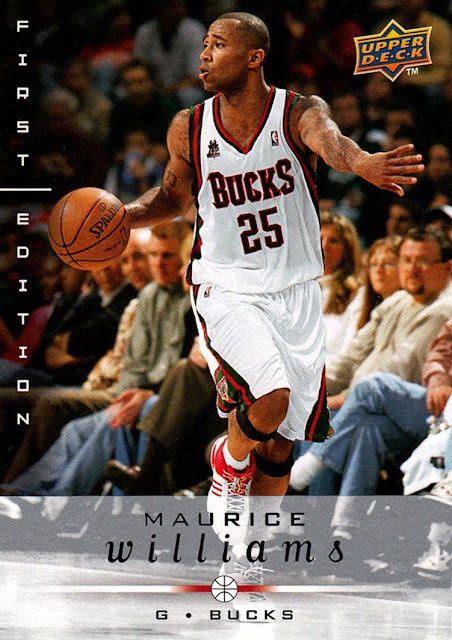 Mo Williams has retired and unretired three times in the past month. I'm not sure if he is retired now or just out injured, he is currently with the Cavaliers. I think. 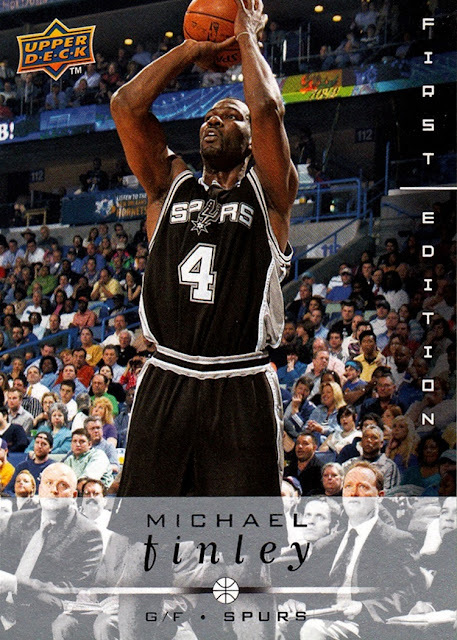 Michael Finley was always a favorite player of mine. He's currently retired. 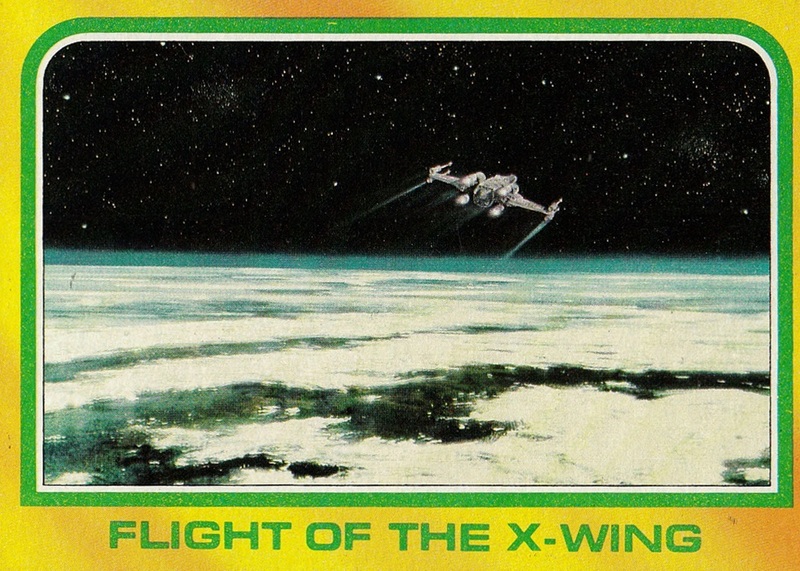 The first card out of the pack, you can see the bend in the top left corner. Those two grayish lines are the bend. I'm not sure if Butler is still in the NBA or not. 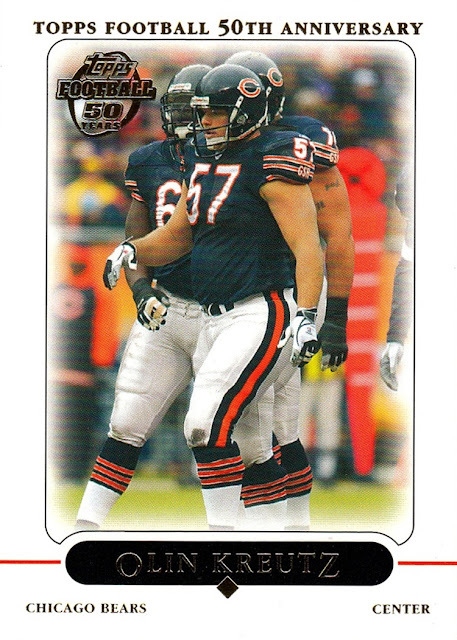 I like sets of retired players, I don't like it as much when they are shoehorned into normal sets. 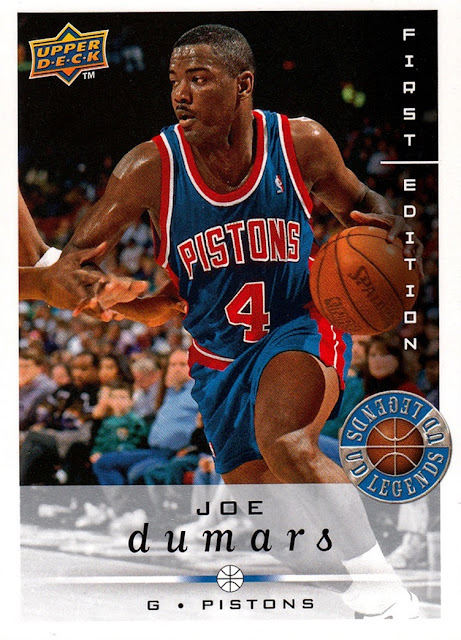 I remember seeing Dumars play. Gallinari RC. Currently a starter on the Nuggets, he wears #8 because he was born on 8/8/1988. 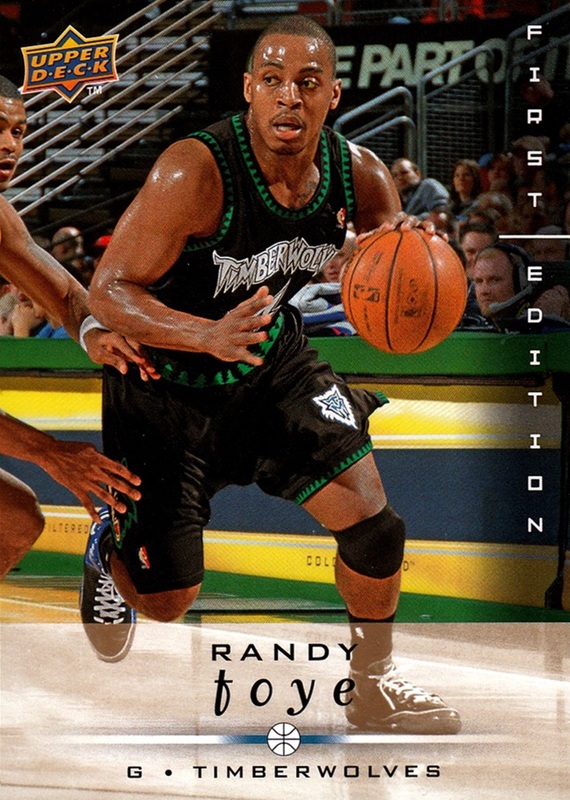 Randy Foye here is a Gold parallel. I have opened 3 packs of this set and the first two gold parallels were pretty darn good- the first was Kevin Durant, the second was Shaquille O'Neal. 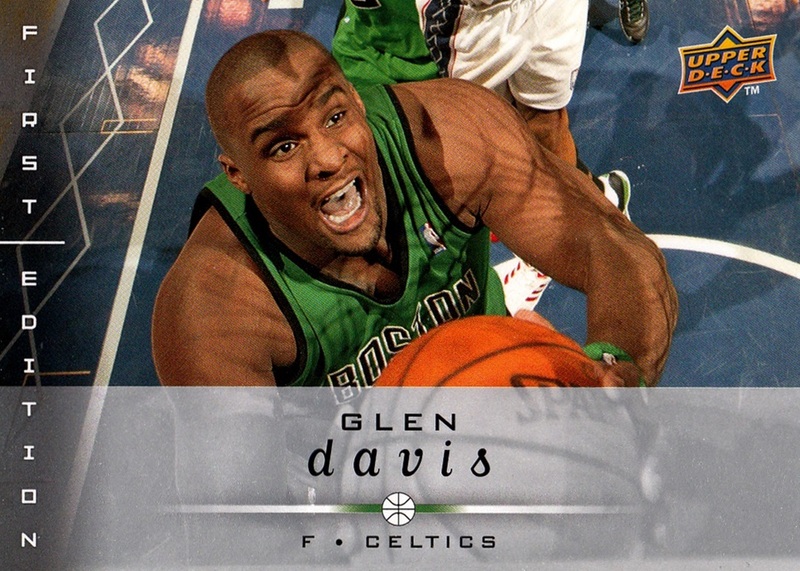 Foye may not have that level of star power, but the card is not a duplicate so I'm still thrilled to have it. He's currently with the Nets and is working his way back from injury. 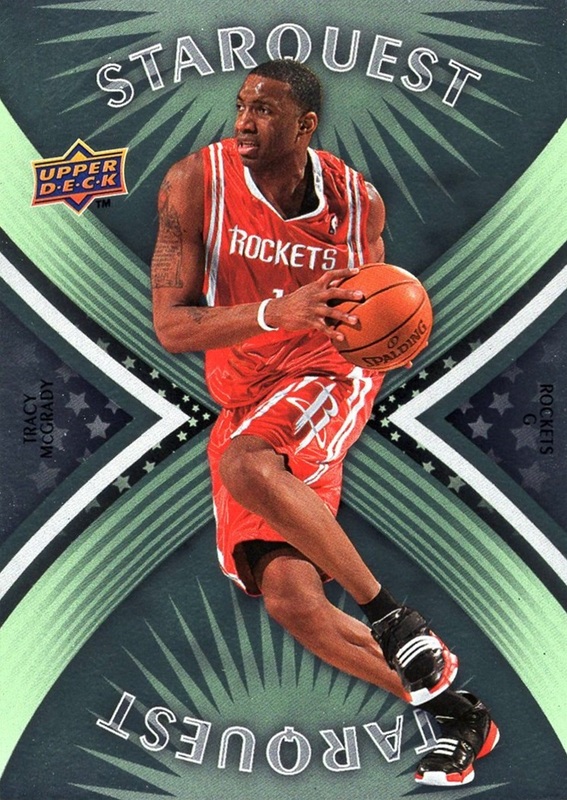 StarQuest Tracy McGrady. These StarQuest cards were one per pack and are mirror foil. I always liked McGrady- I have both home and road Magic jerseys I wear on occasion- but since he retired he's gone into that "complain about everyone younger than you" trap. Face the facts TMac- the Warriors have won a Championship, they will probably win another, and you never even got the Finals, ever. They ARE better than your teams no matter how many times you say they aren't and the championship rings they all wear leave little doubt as to which team would win if you faced them. I am still a fan but I have lost some respect in the past two years. Thank you everyone for two excellent years, here's hoping there's lots more! 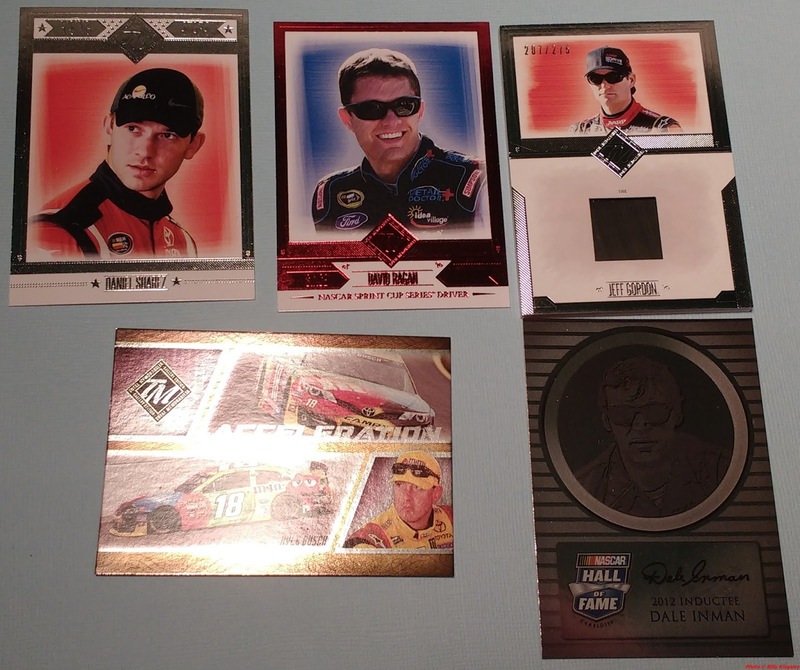 Looking at...you guessed it...Some random Non-Sports cards! The non-sports section of this mini-series is perhaps the most random of all. 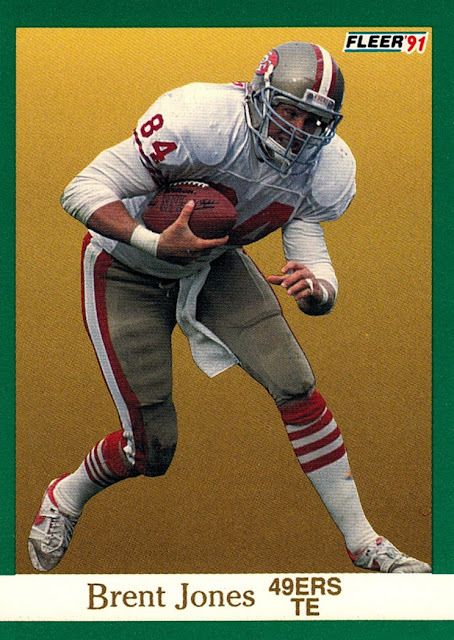 I really enjoy non-sports cards, but they are harder to come by. Most of what I have set aside to scan after everything else is done (or when I need to kill some time, which this was essentially) 50% NBA, 30% hockey, and 10% split evenly between NASCAR, Non-Sports and Football and baseball. This box did not contain any NASCAR. Non-sport is also, naturally, the least covered in this little side projects, but here's what came out of the box. 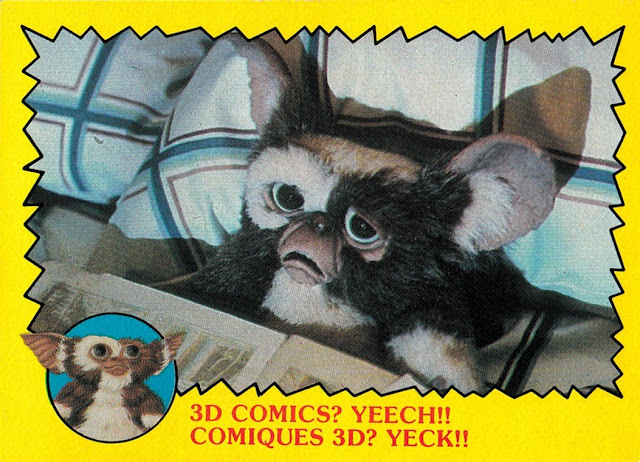 O-Pee-Chee Gremlins. I don't think I've ever actually seen the movie all the way through, I'm not a movie person. But I agree with the sentiment, I hate 3D comics. 1992 Pacific The Story of WWII. 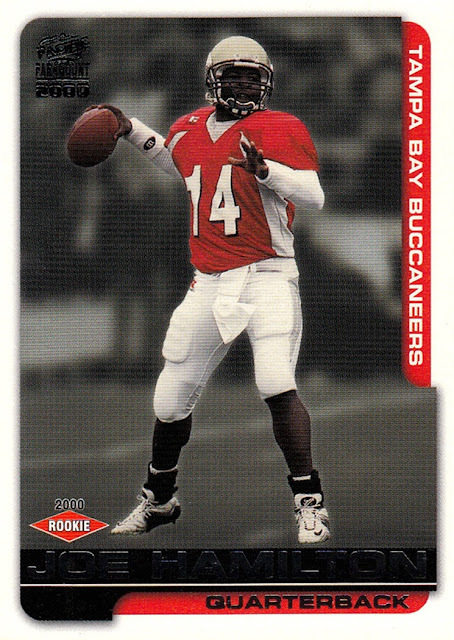 I bought a whole box of these on Ebay, but it's only a 110 card set. You can't really cover World War II in a 110 card set, especially when the last 20 are propaganda and posters like this one. It's a disappointing set. 1994 Ultra X-Men. 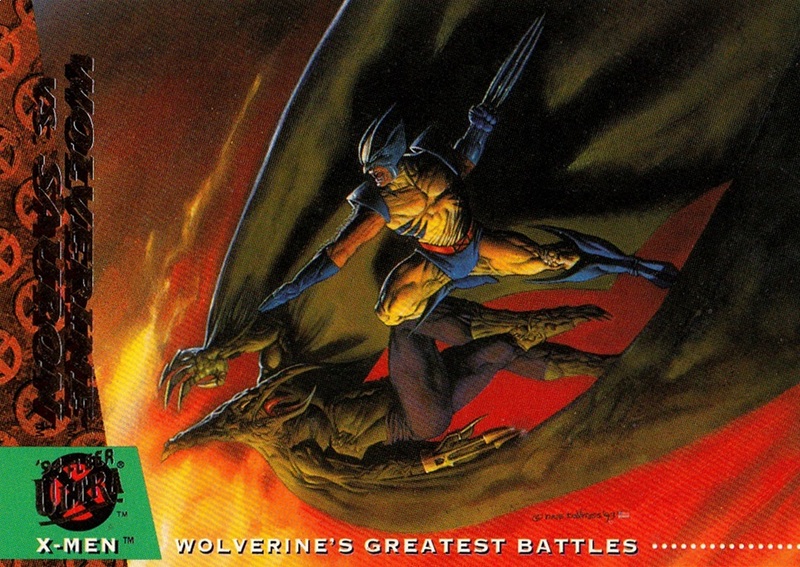 I'm a DC fan (or at least I was) but Marvel has always had better cards. 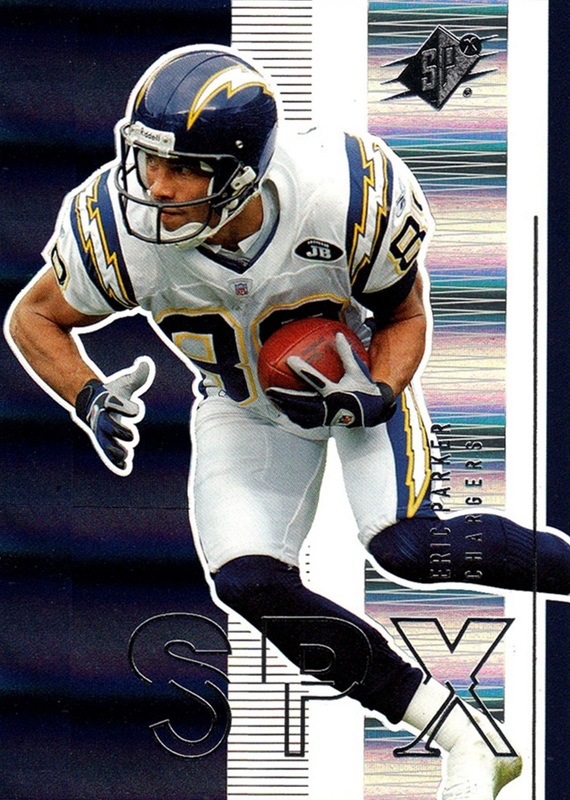 2004 Upper Deck History of the United States. I bought a factory set of this release, and it's an OK set, but it could have been so much more. 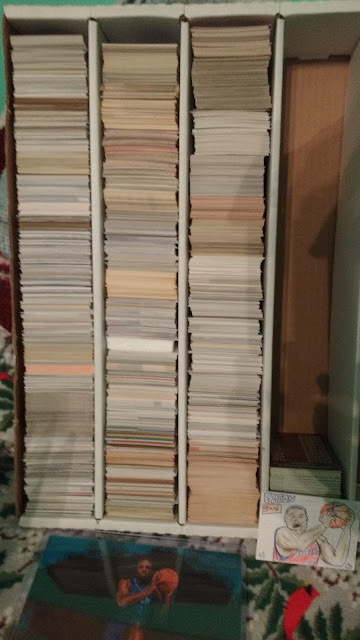 I thought I had scanned all of them, but then I realized I missed about 20 cards, so I mixed them into my stash of cards waiting to be scanned. I'm not totally convinced that I didn't scan them and then accidentally delete them before I uploaded them or moved them to the proper folder, but I can make better scans now so I guess it all works out.. 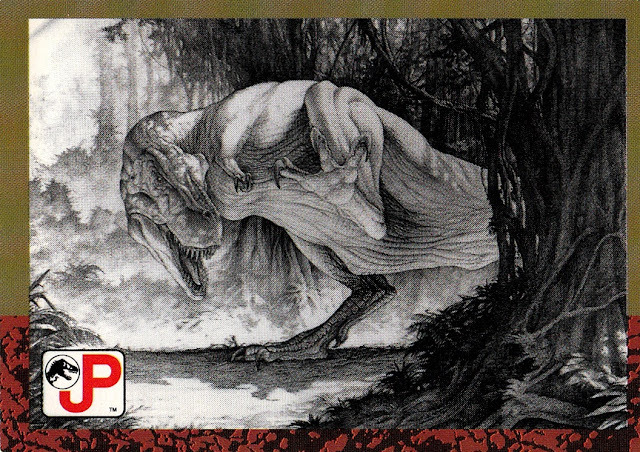 I opened a bunch of these from the Ultra version, but when this Fleer version popped up in my local dealer's boxes, I got it. If I recall correctly, the Ultra version was hobby and the Fleer version retail. The movie- Batman Forever- was terrible, but DC has not done a good movie in my life time so that's no surprise. 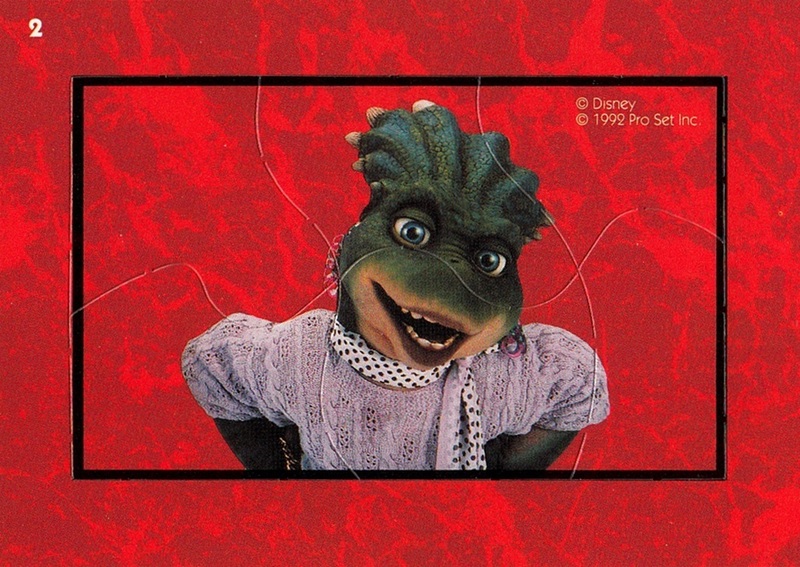 Remember the Dinosaurs TV show? I barely do. I have most of the cards though. 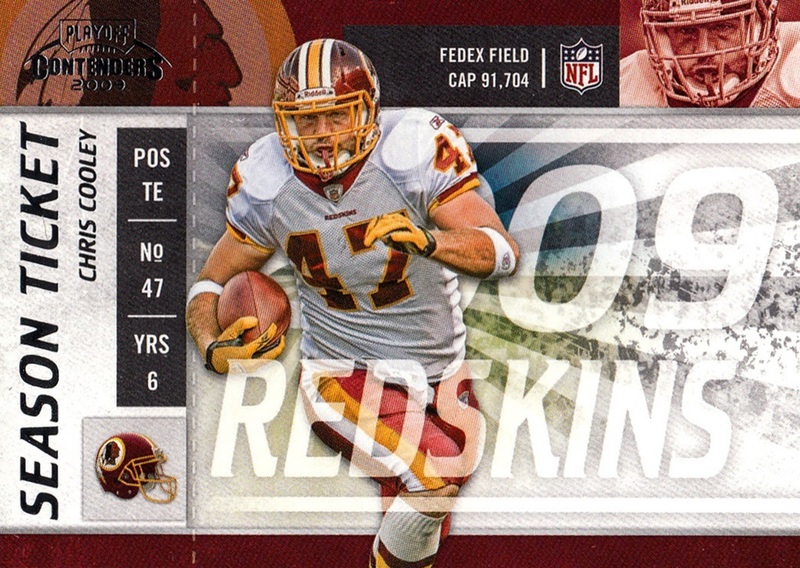 Even though the number is showing on this side, it's the front of the card. All the cards in the insert have the same back. 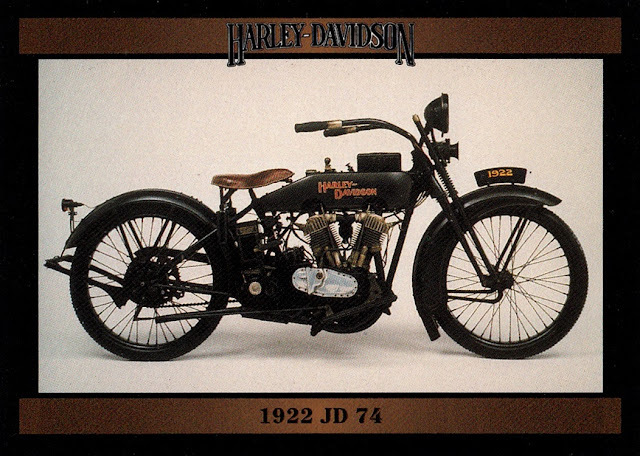 I have no intention of poking out the puzzle pieces, even though I have something like three copies of this card. I'm no fan of Disney but back in the day they had good cartoons. 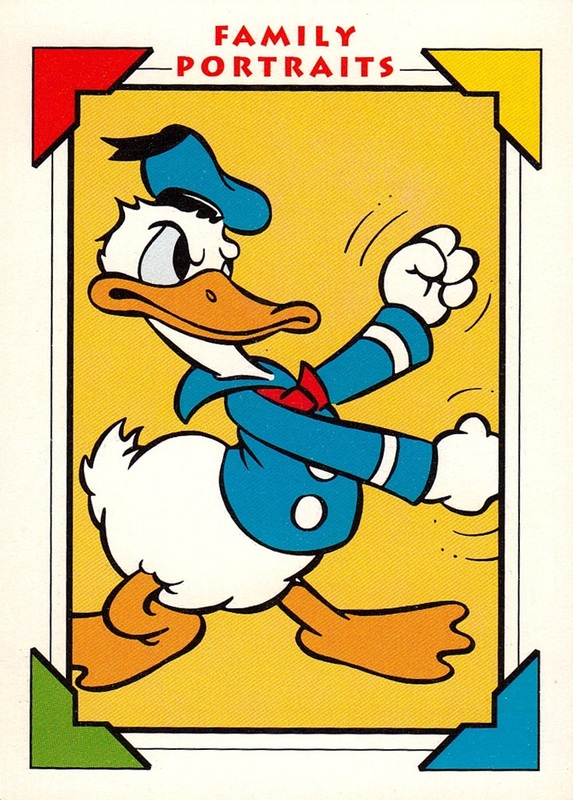 Donald Duck's spazz attacks always made me laugh. Why is it that no cartoon anthropomorphic animals wear pants? Except for Minnie Mouse who wears pants but no shirt? All three of the original Star Wars sets got at least one card scanned. This is the rare third series for Empire Strikes Back. Not actually rare, but rare in my collection. I loved the Tick cartoon, and the video game on Super Nintendo. Bought this for my vehicle collection. One movie series I do like is the Jurassic Park series. Jurassic World, which just came out, is the best of the bunch, in my opinion. 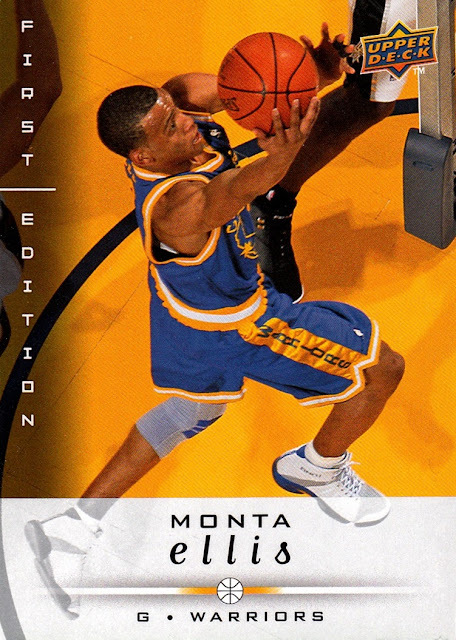 The Pro Set Super Stars cards was actually a really interesting set concept but had no real follow through. It included many different kinds of music over multiple different generations, and I got all of these in trade...I can't remember for sure but I think I may have traded these off Angus of Dawg Day Cards. 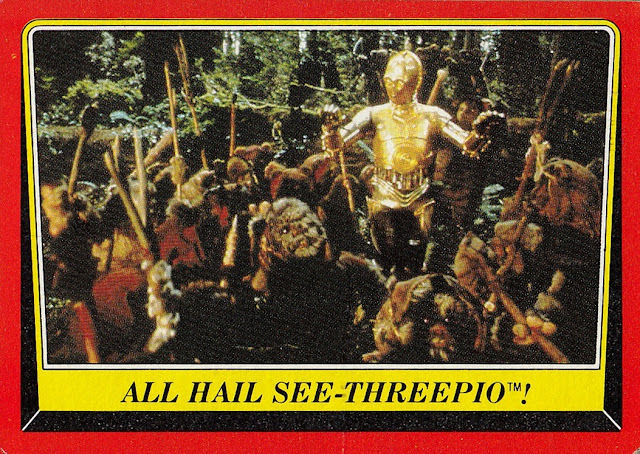 Wow, seeing this scan of this Return of the Jedi card makes me think I should rescan it on scanner #4, because there are way too many lines across it from scanner #3. 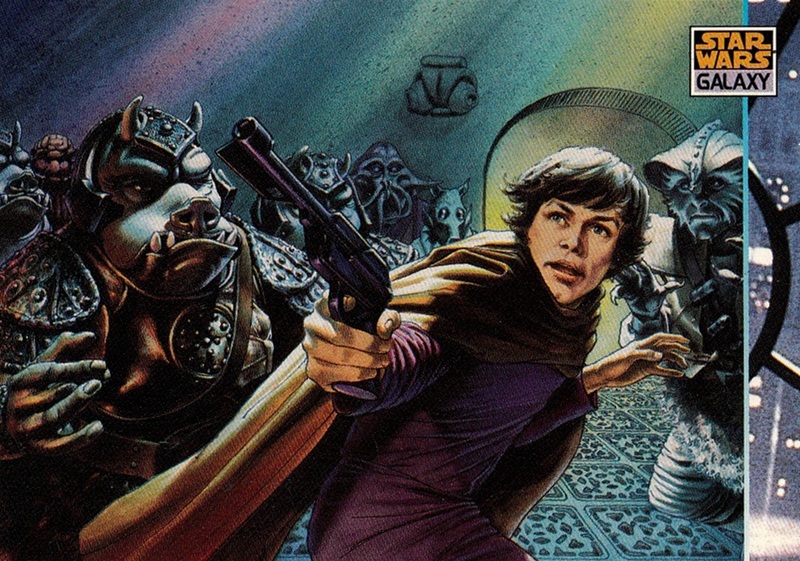 One of these years I will finish the original Star Wars series. Maybe. Star Wars Galaxy ran 7 series from 1993 to 2012. This is series 3 I think. I don't care too much about which series the cards came from so I don't remember. 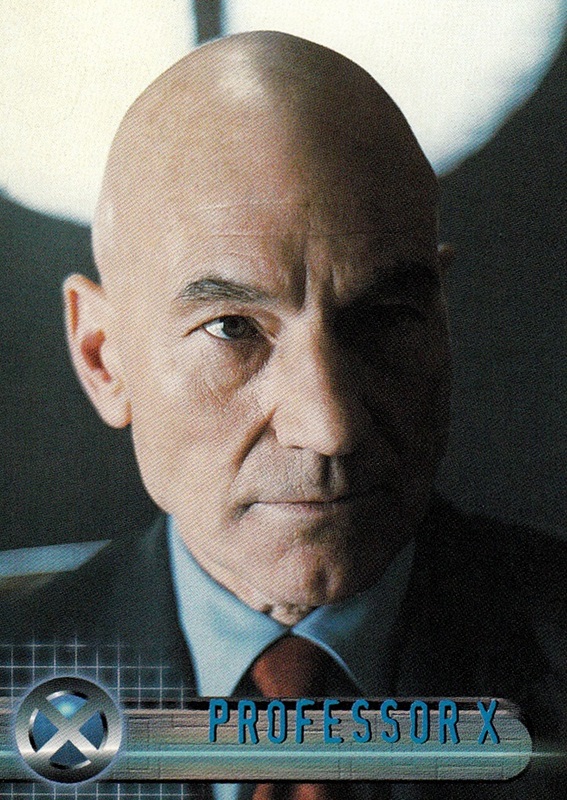 X-Men movie card, from the first movie. I really enjoy the series. I have not seen this original movie in quite a while but I have it on DVD so I should pull it out. During the NBA season that isn't too likely but maybe next offseason. Thanks for reading. This series was a lot of fun for me to do, even if it doesn't seem too popular, so don't be too surprised if I do it again in a few months, the next time I finish filling up the plastic cases. A little later than I normally post in a day, but let's face it- nobody cares about this series so I don't feel too bad about it. Today was the final day of the NASCAR season, and I actually watched the race...normally I just listen while I do other stuff. (that's how I do most sports actually). I enjoyed it. Not necessarily my pick who won, but I can't say I'm really unhappy with it either. 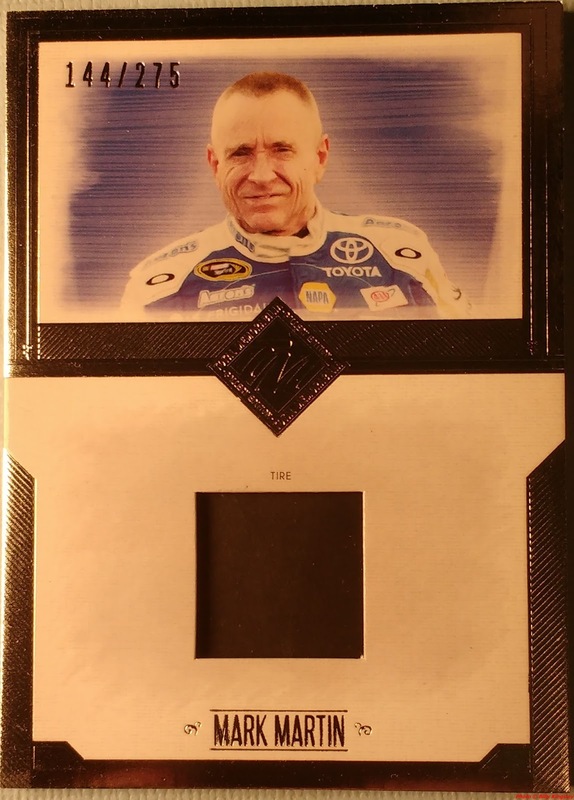 I opened my blaster of 2014 Totally Certified when the race was on about lap #70, but since I was actually watching it, I never got a chance to post it before the race finished. I have not been all that happy with NASCAR lately, but I find when I actually watch as opposed to just listen, I enjoy it more. Ricky Stenhouse Jr. is a subset celebrating his 2013 Cup Rookie of the Year. There are only three subset cards in the 50 card set and this is the first in my collection. Tony Stewart Red parallel, fitting to pull on the three-time champion's final race day. The Danica Acceleration is a duplicate, and the Dale Jarrett Hall of Fame Placque is the Holofoil version. I wish they were all holofoil, it always looks better than mirror foil, but Press Pass loved mirror foil. I really messed up the photo of the relic- sorry about that. Usually the relic photo is better than the overall photo but today it's reversed. It gets the job done. Kyle Larson is on the cusp of superstardom, he's found success in the Ganassi cars which usually are some of the weaker entries of the Chevrolet field. He broke through with his first win in 2016 and I can't help but wonder how many wins he would have in a Hendrick or Gibbs car. It would be more than 1 for sure. He looked really good tonight, nearly pulled off the win and without late cautions he probably would have. I'm a big fan of his and I think this may have been his first relic card ever issued. I don't know for sure because I focus more on base cards. He is also the first driver of Japanese descent to ever win a NASCAR race. His grandparents were interred by the USA during WWII. 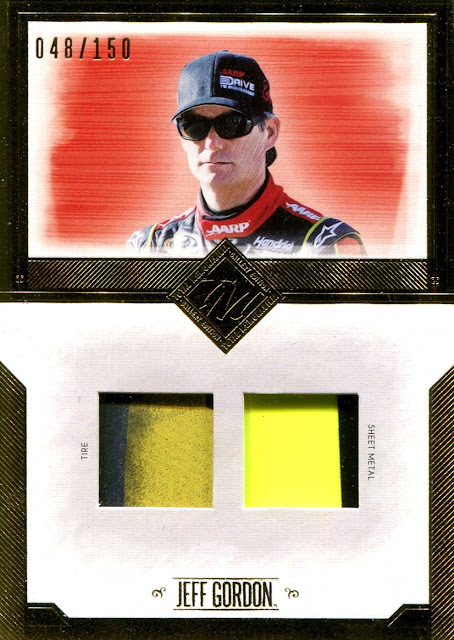 This relic card is from before he moved up to Cup. Holy crap, Gavin was not kidding when he said he was sending me a large box...it was more than 17 pounds! Lots of stuff here. Every major sport was represented and non-sports as well, although most of them can't be shown here because they have misplaced their clothes. First picture is the box as I opened it, after removing the packing material and the second is the cards lined up in a 5000 count box (which doesn't hold that many so I don't know why they call it that) my favorite is the Elton sketch Gavin drew. I'll post a better image soon. There's actually more here I didn't go through yet. I couldn't sit there anymore so I saved the minor league box set he sent me for later. Gavin, thank you so much, it'll take me weeks to process these cards but today may have taken over the lead on most new cards in one day for 2016. I'll know for sure once I document them on my charts and on the Database. Yesterday I posted a look at some random NHL hockey cards that came out of my boxes and onto my scanner tray in a totally random way. Well, I really enjoyed typing that post up and I hadn't moved the scans to their proper place yet, so I figured, I might as well write up a post to cover the other two sports I worked on, and a third for the non-sports I covered. This turned into a pretty random mini series but I really ended up enjoying it, both the scanning of the "whatever came out of the box" and then the posting of it. Like the hockey post, looking at one card from each set. 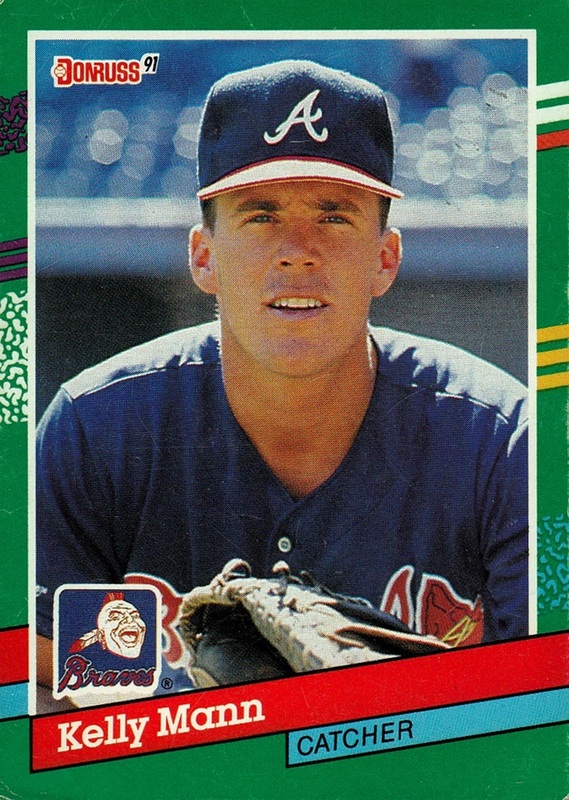 1991 Donruss. As you can see from the scan it's not in the greatest shape but I don't mind. 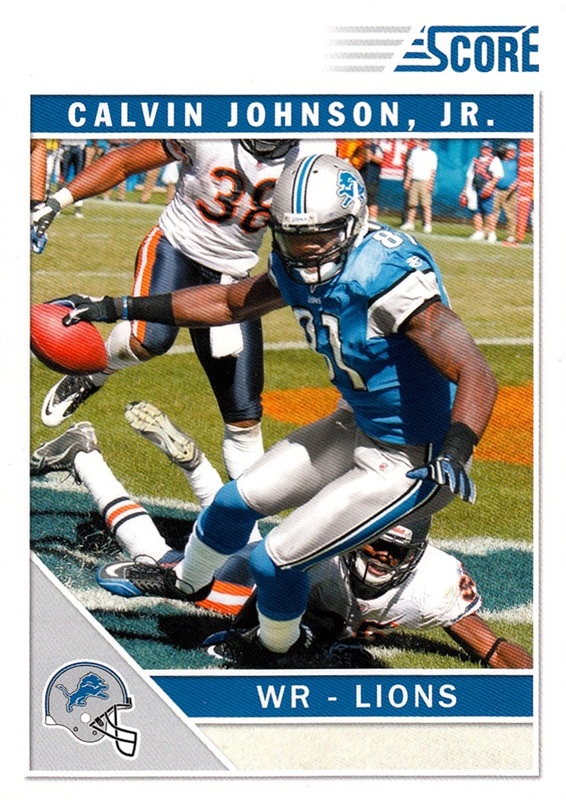 It threw me at first when Donruss was using different colors for the border in the same set. Luckily, when I took the time to actually look at the logo, I saw they were one in the same. 1991 Fleer. Fleer was always my favorite company for the NBA, but this set really does not work for me. 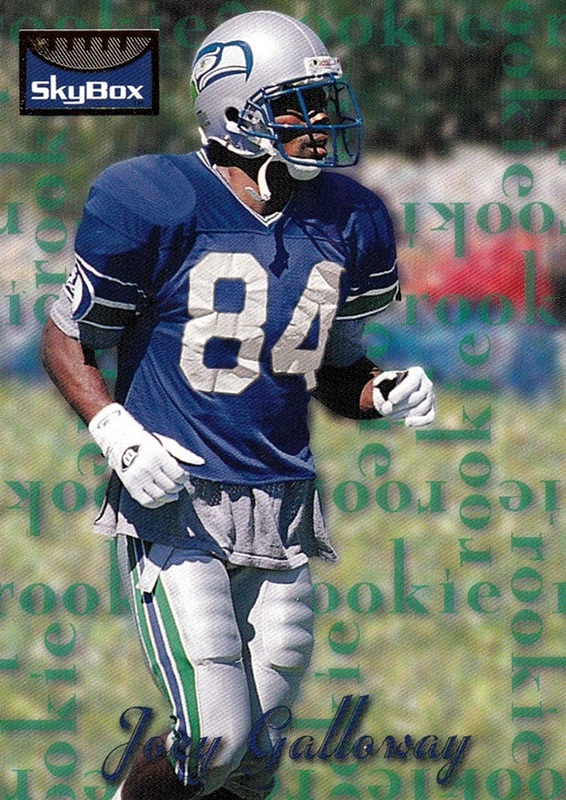 I don't like cards where the player has been cut out of the image and placed over a single color background, or even any other background.. Just use the real photo! 1991 O-Pee-Chee. I don't actually have any of the Topps set that year, but I have quite a few 1991 O-Pee-Chees, 34 of them in fact, to make it the 7th largest baseball set in my collection. 1991 Ultra football. I had no idea that Ultra existed before the 1992-93 set issued for NBA and NHL. Based on the background, nobody else knew either. This is the largest set in my football collection, with 248 cards present. It's not the first time I've shown this set...it's not even the first time this week! 1995 Skybox. I think he might be a rookie. 2000 Pacific Paramount. That crosshatching appears on the card. I believe this and the card above it are the only examples of each set in my collection. 2005 SPx- holofoily but not mirror foily. Yes, I just made up a word. If Shakespeare can make up words because he was too drunk to remember how to properly write them, then I can make up a word to fit a need here! 2005 Topps. Have some of these. Not very spectacular, but for a flagship set it's just right. I like the 50th logo on the cards. 2009 Playoff Contenders. 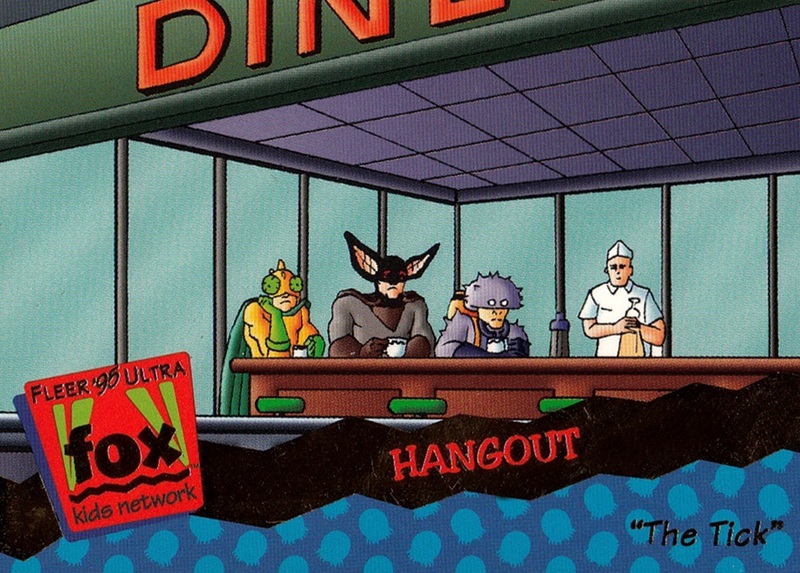 A very busy card, lots of stuff going on here and very little of it enhances the look of the card. 2011 Score. Good photography, large base set, nice texture to card.. Can't complain here. 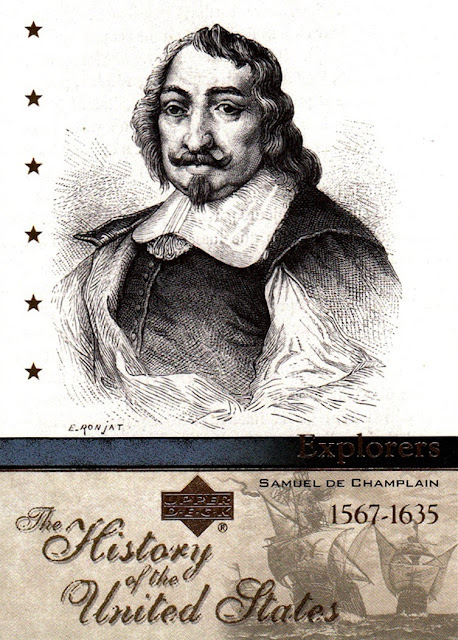 An insert from 2011 Score. Technically that's more than one card from the same set, but the post was a little weak otherwise. Bonus sport card! 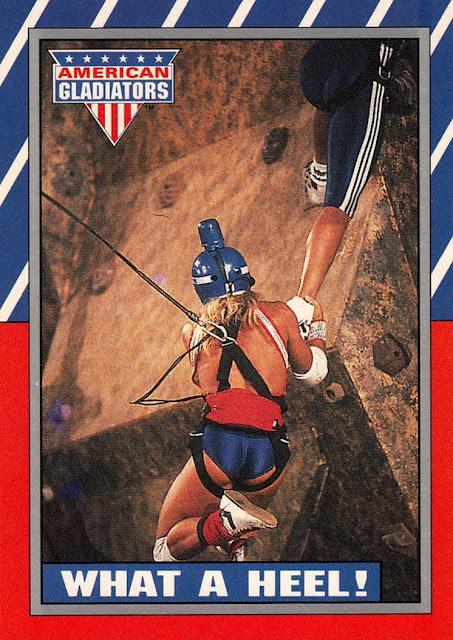 Well, I guess that American Gladiators counts as a sport card. 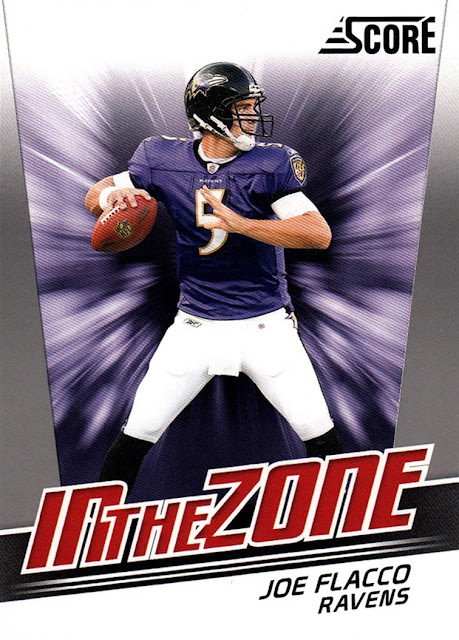 I loved this show when it was new, and I was thrilled when ESPN Classic had it on a few years ago. If it was still on, I would still watch it.